Ideal for vacant homes on Cape Cod. We can install a low temperature alarm and be notified if the temperature in your second home or vacation home gets dangerously low while your away to prevent costly plumbing failures due to frozen and bursting pipes. There are several options available for monitoring environmental conditions like temperature and other things like whether the power is on after a storm, etc at a vacant home. 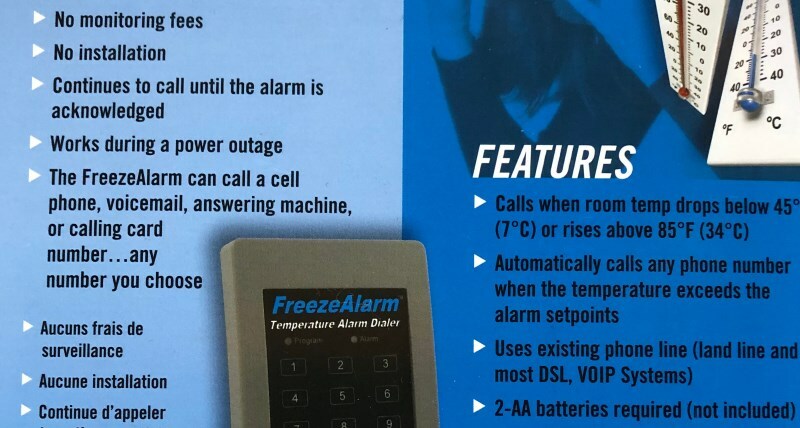 These range from fancy wifi and alarm system sensors to simple auto phone dialers that can call and alert of changing conditions. For this example, we’ll discuss the simple auto dialer system we use in some of our home watch client’s homes. If the area reaches a temperature below 45 degrees, it will notify us of a low temperature environment in your home. Great for monitoring vacant second homes on Cape Cod. Monitor areas that could lead to expensive repairs due to cold weather. Like freezing and bursting pipes. Perfect for basements and crawl spaces. Will also notify us of power outages. Couple this with our home watch or property patrol services and your vacation home can be safe from catastrophic damage due to frozen pipes and the subsequent flooding.